One of the biggest challenges every investor faces is how to find companies that are worth investing? And the question is valid, there are more than 5,000 companies listed in the stock market, going through each of them to find a handful of investment worthy stocks is like finding needle in a haystack. That is the reason why you need a filtration process to weed out all the poor quality stocks so that you get a list of only high quality ideas. While there are many useful screening tools such as Capital Line, Ace Equity etc., but all these tools are very expensive and may not be as useful for an average investor. One of the most useful tools I have been using for the past many years for the same purpose is Screener.in. In this post of how to use screener.in, we will learn how to use this free online tool to find the best stocks for long term investment. Note: Before I begin explaining how to use screener.in for selecting good stocks, let me tell you this, researching stocks is beyond number crunching, screening tools simply give you details about past performance of the business, and does not say anything about the quality of business and its longevity. Relying solely on screening tools for your research is not a great investment strategy. Screener.in is a free stock screening tool that can be used to find best stocks based on various fundamental factors. In this post we will learn how to use screener.in for basic screening of stocks. Step 2: When you click on the “register for free”, button, you will see a page asking for your email ID, and password. Simply enter the email ID and password and click “Register” button, that’s it! You have successfully created an account. Once you have created a free account, it’s now time to filter stocks based on certain criteria. Screener.in has a feature called “Query builder” which can be used to enter various criteria for selecting stocks. Remember, it is important to use the term “AND” (without quotes) while entering multiple filtration criteria otherwise, it will lead to error message. The query above will give you a list of stock that have been performing well for the past 5 years on various criteria. However, finding a list of stocks that have done well in the past is not enough, reason? Because, every financial statement is a record of historical performance of the company and does not tell you anything about its future growth potential. Since an investor today cannot profit from yesterday’s growth, in order to find great stocks for long term investment, you must make sure that the company in question will be able to repeat its past financial performance in the future as well. Following is a list of questions you must ask yourself (and look for in a business) before making an investment decision. Is the business of the company easy to understand? It is always easy to understand businesses that are simple in nature, compared to those that are too complex. What does a simple business mean? Mostly, these are the businesses that we interact with on a daily basis, and don’t really have to dig deeper to understand them. For example, companies like Nestle and HUL are much easier to understand as we use their products in our daily lives, compared to an IT or a Pharmaceutical company that have much more complex business models. Will the company be around and stay profitable for the next 10 years? Finding the answer to this question is necessary as it gives you a lot of insight continuity of demand for the products or services of the company. Longer the continuity remains, stronger are the chances of longevity of business. Businesses that have better longevity can be great compounding machines, giving multi-fold returns to shareholders in the long term. Does the company have a sustainable economic moat and a long term durable competitive advantage? Economic moat refers to a unique ability of a business to protect itself from being taken over by competitors. A sustainable economic moat provides a business significant lead over peers. Economic moats are the reason how companies have better pricing power, a loyal customer base that allows them to get repeat sales without spending too much on advertising and marketing. How good is the management of the company? The quality of management is determined by how prudent they are in terms of capital allocation. Companies that allocate their capital wisely, get higher return on their invested capital compared to their peers. This is evident when the Return on capital of a company is higher than its peers. The second factor that determines the quality of the management is the Corporate Governance. An honest and able management is always vocal about the ongoing activities in the business and have a clear vision about future growth. Does the company require continuous capital expenditure to keep growing? There is an old saying in the Wall Street, “never invest in something that eats or needs repairs.” Companies that continuously need more cash in order to grow are not great investments. Why? Since they need continuous capital infusion to fund their business, the moment business runs out of further sources to raise capital to fund itself, its growth will come to a screeching halt. Put simply, spending continuously in order to grow is like running on a treadmill, the moment you stop running, you will fall flat on your face. Does the company generate more cash than it consumes? The logic is simple here, if a company generates more cash than it needs to grow itself, it will be left with a lot of free cash that can be used to fund future expansions without relying on external debt. Also, cash generators have a better probability to survive during tough times and bad economic situations. 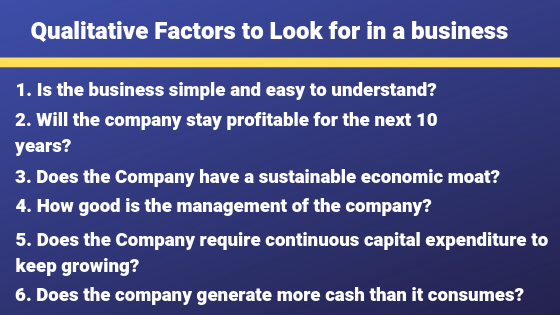 Asking these questions mentioned above will help you in narrowing down to the stocks that have not only performed financially well in the past, but also have a great potential to keep growing in the future. Before I conclude this post, here is a quick summary on the entire process of stock picking and what we have learned so far. Create a list of good stocks that have performed well in the past, have low debt, continuously generated high return on invested capital and are selling at decent valuations. Invest within your circle of competence, know your limits and stay within those limits, it does not matter how big or small your circle of competence is, all you need is a handful of good stocks. For the start, look around your house and find the companies that you interact with on a daily basis. Look for stable businesses, that have been consistent performers for the past 7-10 years, do not confuse speed of growth with great performance, it is the consistency of growth that matters, not rate of growth. Next, look for sustainable economic moats, characteristics that keep a business safe from being taken over by competitors (such as brand name, monopoly, patents, high entry barrier, strong distribution network), and high return in invested capital, which shows that company’s management is prudent in terms of capital allocation. Finally, find out if the stock is trading at a reasonable price. Great businesses usually trade at a slight premium, however, it is still important to avoid overpaying, you can use valuation methods like P/E Ratio, and Discounted Cash Flow method to ascertain value of a stock. There is a saying in the financial industry, where is the customer’s Yacht? Which implies, if the investment advisors were so effective in making money for their clients, why none of their clients have ever made a fortune? Stock tips and investment advice never created a rich, successful investor, the only way can succeed in the world of investing is by doing your own research carefully and buying good businesses for long term. I hope you find this article useful and knowledgeable, do let me know your questions, opinions and views in the comment section below. Thank You for reading, happy investing.